evealing what may be a lineup of new Android and Windows Mobile phones. The leak purportedly shows scanned images from a pamphlet displaying the specs and designs of eight Android and Windows Mobile devices scheduled for release the first six months of 2010. The images appeared on an online forum on Sunday, and are supposedly from an October 2009 meeting in Vienna, Austria. three WinMo phones are supposedly in the works for early 2010 as well. This is only an overview, and if you want to see more detailed information and additional scans supposedly from the HTC pamphlet, check out the XDA developers forum. It should be noted that if these phones -- if real -- aren't necessarily all heading to the United States. In fact, those that are U.S.-bound may come later than these advertised launch dates. sets, according to forum XDA forum participant B3ler3fonte, supplier of the scans. It just means that T-Mobile is supposedly interested in these models. You can read the complete explanation on the XDA forum. B3ler3fonte says he/she is not a T-Mobile employee, and it's not clear how the person came into possession of this information. Unless otherwise noted, all of these devices are believed to have 802.11 b/g Wi-Fi, Bluetooth, GPS, Microsoft Exchange support; built-in social networking applications for Facebook, Flickr, and Twitter; and 512MB of internal memory with an expandable SD card slot. It's also not clear which version of Android these phones would run, among Cupcake (1.5), Donut (1.6) and Eclair (2.0). TC Legend has a 3.2-inch AMOLED touchscreen, 5-megapixel camera with autofocus and flash, digital compass, 802.11 b/g Wi-Fi, FM radio, and Exchange support. It's not clear if this phone would have a physical keyboard. Scheduled for release in April, the Bravo would boast 720p video capture and a 5-megapixel still camera with auto focus and flash. Other specs include a digital compass, FM radio, DivX video support, Dolby sound, and an optical joystick. The Bravo is another device with a question mark surrounding its physical keyboard specs. Scheduled for April release, this device would feature a 12-button keypad instead of a QWERTY keyboard, which means this could be an Android-powered feature phone instead of a smartphone. The Tide comes with a 2.68-inch QVGA touchscreen, 3.2-megapixel autofocus camera, and HTC Widgets---HTC's own overlay for Android applications. Due out in June, this Blackberry-inspired device comes with a full QWERTY keyboard, 2.6-inch QVGA touchscreen with landscape view, 3.2-megapixel camera, and FM radio. the HTC Hero, and its most interesting feature is its 5-megapixel autofocus and flash camera with facetagging. The device is supposedly scheduled for May release and has a 3.2-inch QVGA touchscreen, FM radio, and HTC Sense--an HTC-branded complete user interface. Note that once again, no physical keyboard is pictured. Scheduled for release in April 2010, the Photon has a 3.2-inch HVGA touchscreen and a 5-megapixel auto focus camera. The Trophy has almost the same specs as those listed for the Photon, except that the touchscreen is a 3.0-inch VGA display. 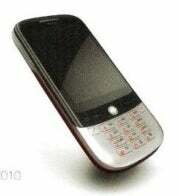 This slider phone features a slideout QWERTY keyboard, 3.0-inch WQVGA touchscreen, and a 3.2-megapixel camera.